Garden Thieves Pictures recently released information for their upcoming DVD release of "Tibetan Warrior". The documentary focuses on the journey of Loten Namling, a Tibetan musician who is living in exile. Special features on the DVD includes deleted scenes, interviews and music videos. "Tibetan Warrior" hits stores on October 9th. 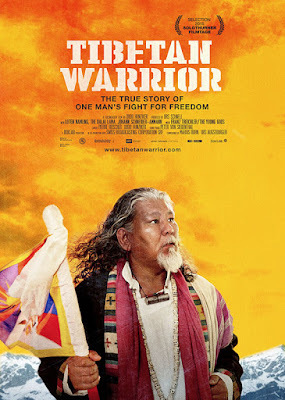 Garden Thieves Pictures is honored to announce the October 9th DVD and VOD release of Dodo Hunziker's Tibetan Warrior, an acclaimed documentary following the journey of Loten Namling. A musician living in exile, Namling is devastated by the self-destructive ways his people have protested the Chinese. Hunziker and his lens follow Namling as he fights for his people the only way he knows how: making his way to the Dalai Lama to seek his help and wisdom. For more than 60 years, Tibetans have been fighting Chinese oppression. But their non-violent struggle appears to be in vain. Now, as a new form of peaceful protest, Tibetans are setting themselves on fire. Loten Namling - an exiled Tibetanmusician living in Switzerland - is deeply disturbed by such self-destructive action. So he sets off on a two month trek from Europe to India, on a one-man mission to meet top politicians, experts and young radicals. He himself becomes increasingly radical, and is on the verge of violent protest. Finally he ends up at the Office of the Dalai Lama in India, to seek the advice from the exiled Tibetan leader. The October 9th DVD release of Tibetan Warrior will exclusively include deleted scenes, interviews and music videos.